Introduction: The structure and function of complex organisms are subject to the laws of physics and chemistry. Organisms vary in size (and shape) over an extremely large range. How size affects their structure and function is a fascinating subject - the study is called allometric scaling. 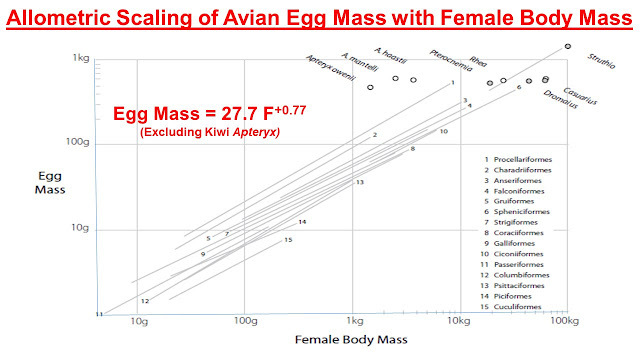 In this blog, I shall look at scaling of avian eggs - probably one of the simplest systems for such a study. Eggs of different birds are roughly similar in shape and are some of the simplest structures available. 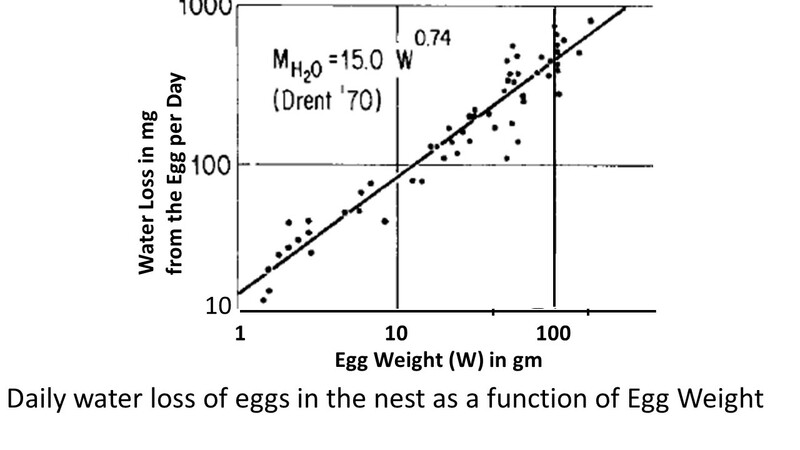 Scaling behaviour of eggs points to a common reproductive strategy in birds. One can attempt to explain deviations from simple scaling behaviour as adaptations to prevailing environmental factors. What is an egg? - An egg (ovum) is essentially a reproductive cell produced by the female. The ovum is fertilized by the male sperm. Once fertilized, the egg has a full complement of chromosomes and genes for development. The fertilized cell (zygote) then rapidly divides to produce a developing embryo. An avian or bird egg is designed to nourish and protect the embryo growing from the zygote. Each fertile egg contains everything, except oxygen, to support the subsequent development of the embryo during incubation. The egg needs only a warm humid environment and oxygen while the embryo is maturing. A healthy chick hatches at the end of incubation. In mammals, the embryo develops inside the mother receiving its nourishment through the placenta; the baby is delivered to the outside world on maturity. About Birds: Birds sizes range from 3 g hummingbirds to the now extinct elephant bird (Aepyornis) weighing over 500 kg - a mass range greater than 150,000. Their eggs weigh from 0.3 g to 10 kg - a range of over 30,000. 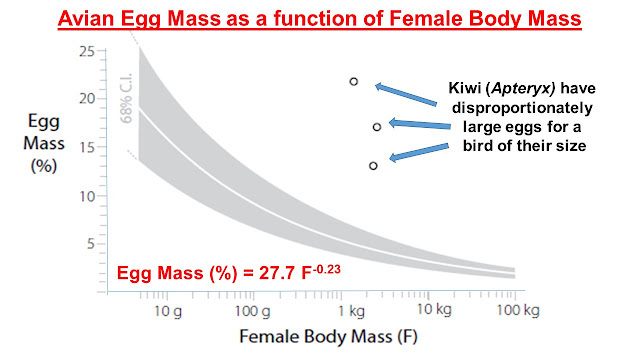 Please note that the egg mass is in grams but the female body mass is in kg. Within a bird species, the variation appears to follow closely an exponent of 0.77. 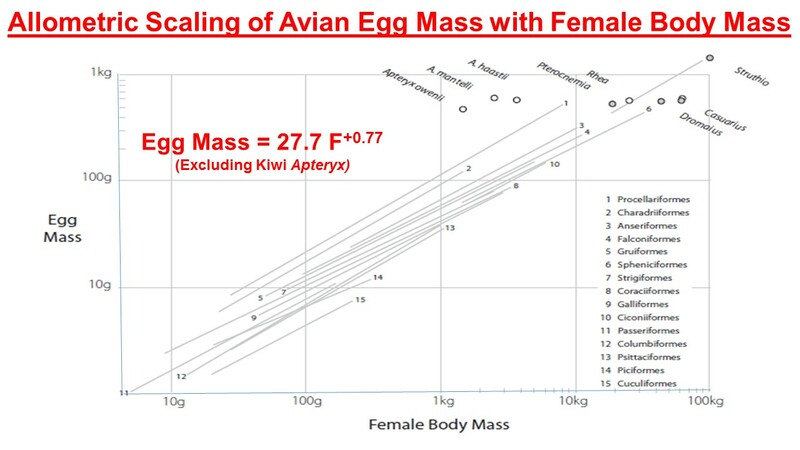 Different species have a significant variation in the egg to body weight ratio but eggs of a species closely follow the 0.77 exponent with bird mass (parallel lines in the slide) . Small birds invest a large amount of energy, of the order of 20% of their body weight, to produce their eggs - eggs of smaller birds are a bigger percentage of their body weight. Human babies weigh about 6% of their mother's body weight. An avian egg contains all the essential nutritional provisions required for the development of a chick - increased egg weight represents the extra investment by the bird. 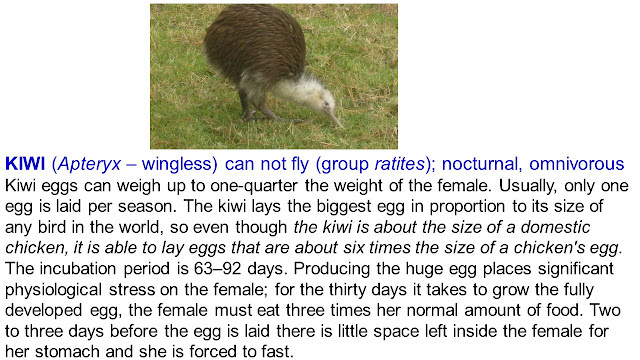 Notice the New Zealand Kiwi (Apteryx) has a disproportionately large egg - we shall discuss some of the ideas to throw light on why this might be so. 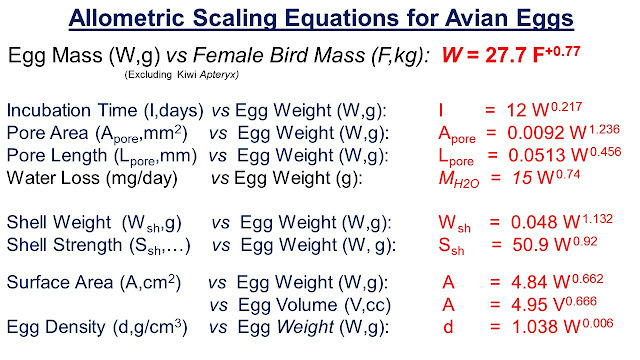 In the rest of this blog, I shall use egg mass as the independent variable - conversion to bird mass is easily achieved using the scaling law given in the second slide. The egg takes a certain time for the chick to develop - the incubation time. During this period, the egg loses water to the outside and this water is supplied by the egg. The space occupied by water vapour is replaced by air diffusing from outside and results in the air cell (number 7 in the previous slide) growing larger. 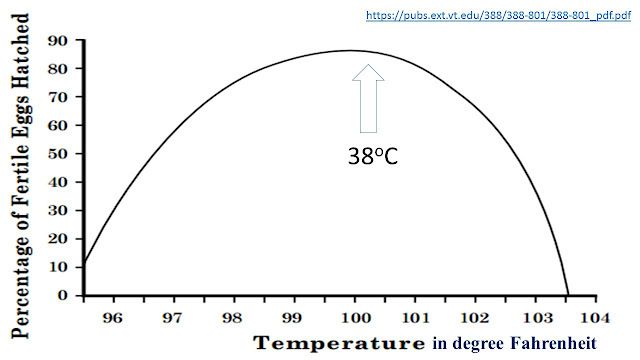 For a chicken egg, the optimum temperature for incubation is 38 C.
The incubation time depends on the initial egg weight. This was studied by Rhan for a large range of bird species. Incubation time of eggs across the bird species is shown in the next slide. Conductance of fluids is proportional to the total pore area (individual pore area times number of pores) and inversely proportional to the pore length (shell thickness). Avian eggs appear to employ some very interesting adaptation strategies in response to environmental and other conditions. We shall look at some examples later but let us talk about the structure of the egg shell first. EGG SHELLS: Egg shells are made of calcium carbonate (density = 2 g/cc) and provide protection for the embryo. Eggs do not vary enormously in overall shape - their surface area scales as 0.666 power of the weight and volume. Although bird eggs appear to be fragile, they are in fact extremely robust. The oval shape applies the same rules of engineering as arched bridges; the convex surface can withstand considerable pressure without breaking. This is essential if the egg is not to crack under the weight of the incubating bird. It takes 12 kg equivalent of pressure to break a swan's egg and 55 kg for an ostrich egg. The relative increase in the weight of the egg shell for larger birds is entirely due to the increase in the thickness of the shell. Thickness of the shell determines its strength against breaking - larger eggs have to support the heavier mass of the parent bird that does the incubating and all eggs experience impacts with other objects in the nest. Egg shells are designed to be sufficiently strong and breaking of normal eggshells in nests is rather infrequent. 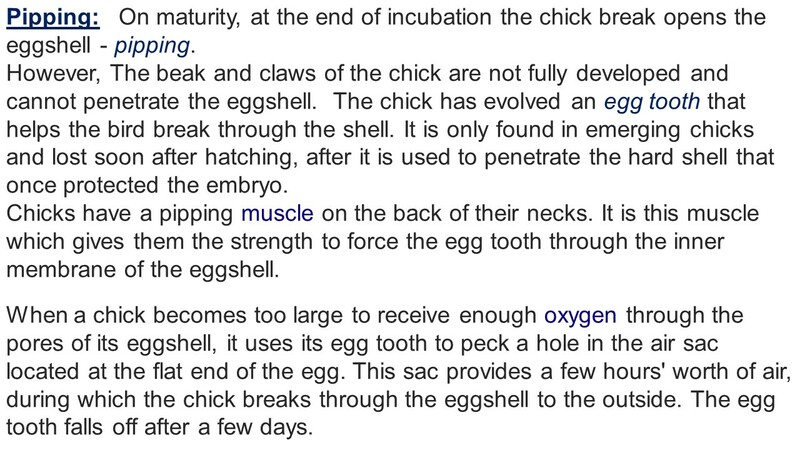 However, eggshells are still required to be weak enough that the hatching chick can break though the shell. It is an interesting compromise. Greater shell thickness will imply that gases will diffuse through the shell less quickly. The effect of greater shell thickness on exchange of gases is compensated by the increase in pore area - remember that Fick's law of diffusion says that water loss is determined by total pore area divided by the pore length (shell thickness). 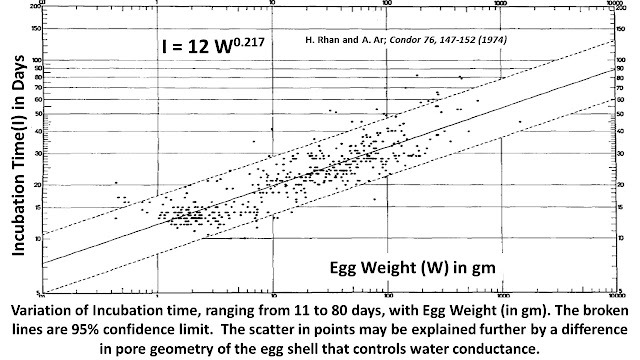 This means that gas conductance per day changes with egg weight as Apore x Lpore or W0.78 - Interestingly, the incubation time changes as W0.217 - such that the total water loss during the incubation of the egg is W0.78x W0.217 or W - proportional to the egg weight. 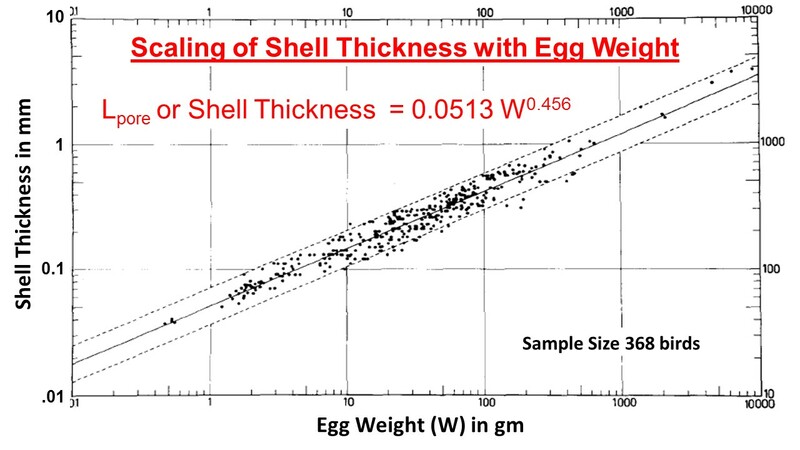 This all makes good sense when we use the laws of physics to understand the variation of shell thickness, pore area with egg weight! 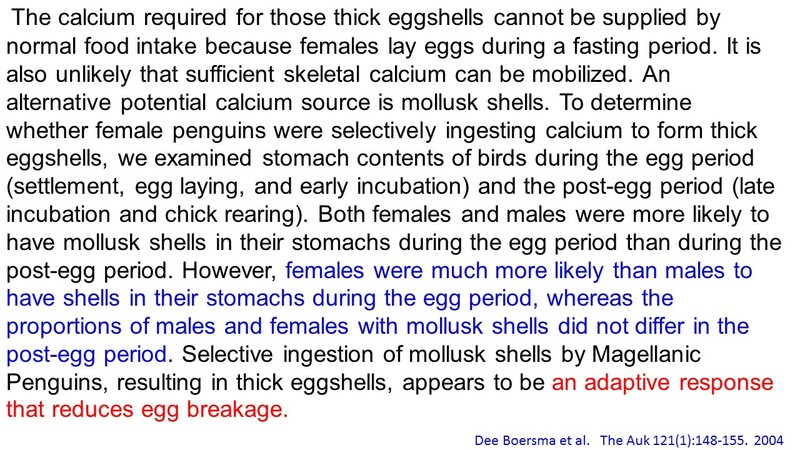 Example 1: The single egg of Cassin’s Auklet (body mass 165 g) weighs about 29 g. The incubation time for a 29 g egg is predicted as 25 days and shell thickness equal to 0.24 mm. The actual incubation time of 38 days is considerably longer than the 25 days predicted for eggs of this size. The measured shell thickness is 0.23 mm - the same as predicted for 29 g egg weight. In order to preserve water loss during incubation to an acceptable level, the Auklet egg has about half as many pores as expected from allometric scaling relationship. The number of pores was estimated as 3295 while the expected value would be 6020. I do not know why auklet eggs have long incubation time but the strategy to manage water loss from the egg makes sense. Example 2: Adaptation to Altitude: Birds breed up to 8500 meters in the Himalayas. Incubation of eggs at high altitudes raises several issues. The atmospheric pressure decreases with altitude and the rate of diffusion of gases across the egg shell is correspondingly affected. 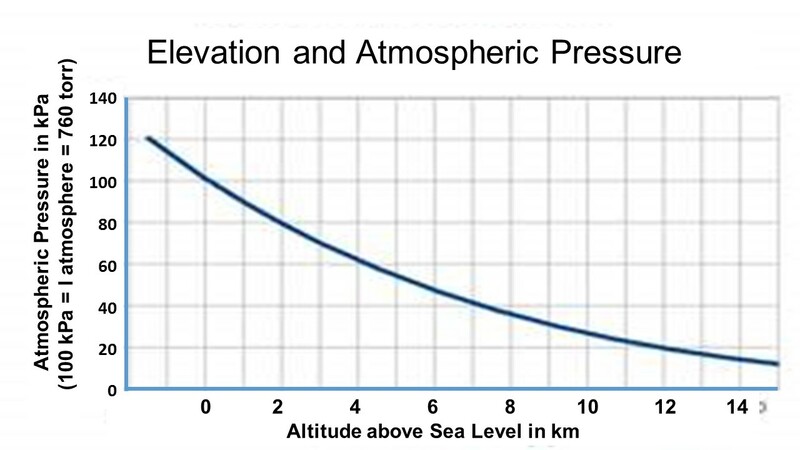 From the slide, we note that relative to sea level, the air pressure is reduced to 35% at 8500 meters and 62% at 4000 meters. Note that the atmospheric pressure at sea level is 760 torr. Because molecules move more freely at lower density, the overall diffusion of oxygen, carbon di-oxide and water molecules through the pores of the egg shell is increased at higher altitudes. The rate of water loss depends on the water vapour pressure difference between the inside and outside of the egg. To achieve the measured amount of water loss, optimum nest water vapour pressure should be about 30 torr, corresponding to 42% humidity. The incubating bird ensures that humudity in the nest is maintained at the correct level. At higher altitudes, the increased rate of diffusion produces increased water loss. Birds adapt to live and breed at higher altitudes by producing eggs with a lower effective pore area. This compensation limits the water loss through the eggshell at higher altitudes to be the same as at sea level. Red-winged blackbird eggs at 2410 m altitude had total pore area reduced to 0.72 of the total pore area for bird eggs at 87 m altitude. Indian chicken eggs at 3500 m altitude had total pore area reduced to 0.65 of the total pore area for bird eggs at 220 m altitude. While this adaptation of pore area reduction solves the matter of controlling water loss from the egg, it raises a problem for the supply of sufficient oxygen to the growing embryo. OXYGEN: The partial pressure (concentration) of oxygen decreases with altitude and with reduced pore area, the egg has to find ways of supplying sufficient oxygen to the embryo. All living beings must adapt to the reduced oxygen concentration (hypoxia) at higher altitudes (60% of sea-level concentration at 4000 meters). Avian embryos, at high altitudes, do not have the benefit of maternal protection against hypoxia as in mammals. However, avian eggs do hatch successfully at altitudes up to 6500 m or even higher. Avian eggs have evolved different strategies to solve the problem of hypoxia leading to successful hatching at high altitudes. 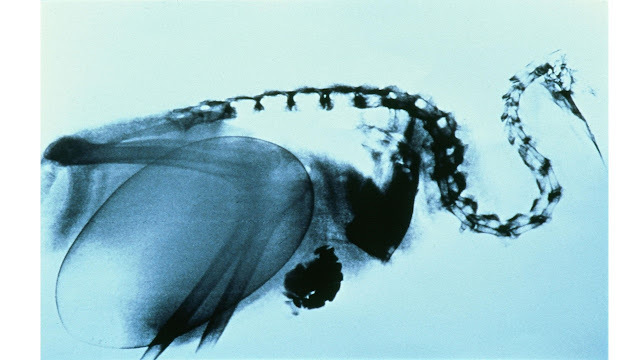 A discussion of strategies in detail is outside the scope of this blog, however a common feature is that all bird embryos have blood hemoglobin (Hb) with high affinity for oxygen. 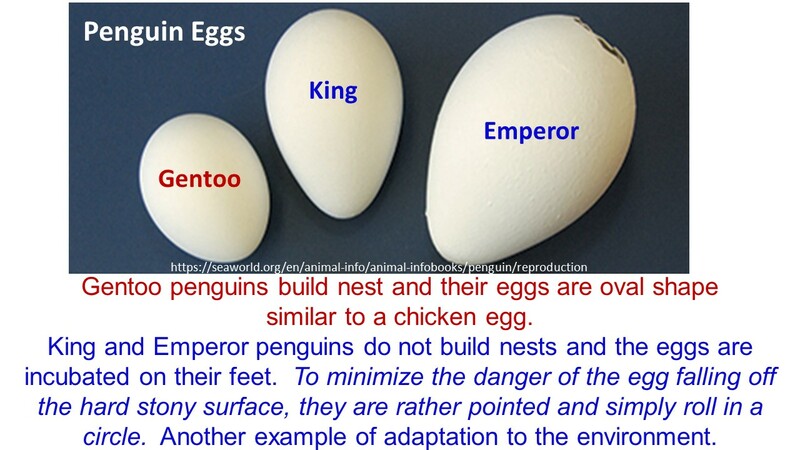 Example 3: Penguin's Thick Eggshells - An Adaptive Trait: Sea birds that nest on hard surfaces lay thick eggs to prevent breakage of eggs; thick eggshells are stronger as strength of the eggshell increases as square of the shell thickness. I shall discuss here the example of penguin species, Magellanic Penguins (Spheniscus magellanicus) incubate their eggs on hard substrates with little nesting material—all circumstances that could lead to high rates of egg breakage. 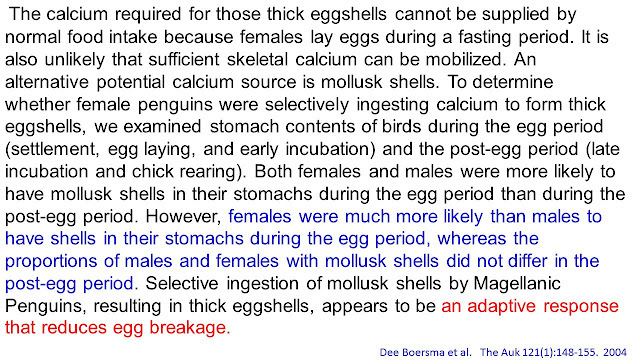 However, Magellanic Penguin eggs are seldom broken - low breakage rates attributable to thick eggshells. 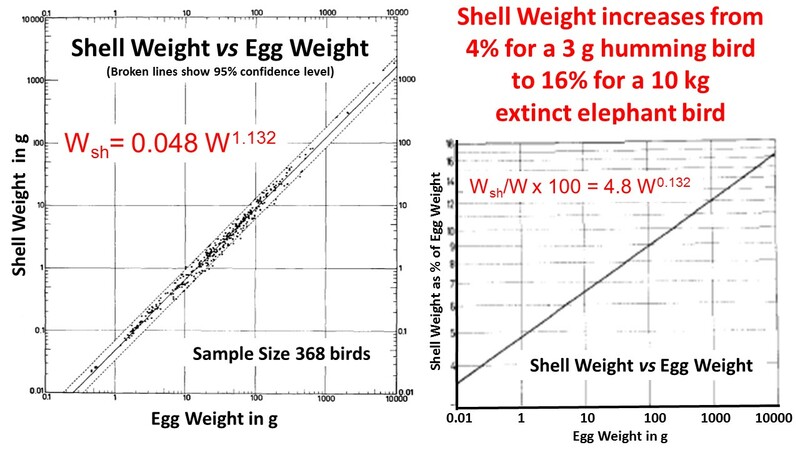 Average weight of a Magellanic Penguin Egg is 128 g and from the scaling of eggshell thickness (L) with egg weight (W), I would expect that L should be 0.52 mm. The measured average value of L is 0.81 mm - 56% thicker than expected for the size of the egg. How the extra calcium for the thicker eggshell is provided is a good indication of adaptive strategy. Another adaption strategy that penguins employ is that their eggs are quite pointed. This ensures that they roll in a circle and do not fall off the cliff on which they are being incubated. 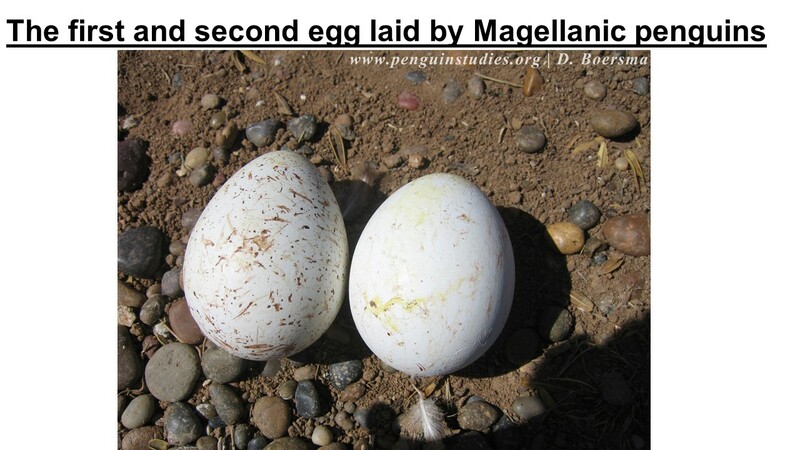 The following two slides show the pointed eggs of some penguin species. Example 4: Why are the Kiwi Eggs so big?? A large egg has some advantages. Most bird eggs are 35-40% yolk but the kiwi egg is 65% yolk. The nutritious yolk produces kiwi chicks that hatch fully feathered and are independent. The yolk continues to sustain the chick for the first few weeks of its life. By that time, chicks can provide for themselves and kiwi parent seldom have to feed their offspring. An earlier suggestion was by Stephen Gould that the big size of the kiwi egg is simply a relic from when the kiwis were much bigger birds. In New Zealand, until a 1000 years ago there were no major ground-dwelling egg-eating predators to encourage a shrunken egg and discourage the loss of mobility that comes from carrying such a large egg. Lively debate has continued over the past few decades and the most recent DNA analyses appear to indicate that the extinct Madagascan Elephant birds are the closest relatives of the New Zealand kiwi. This is fascinating research and has lot to say about how and when flightless birds spread over the globe and are now found in all continents. 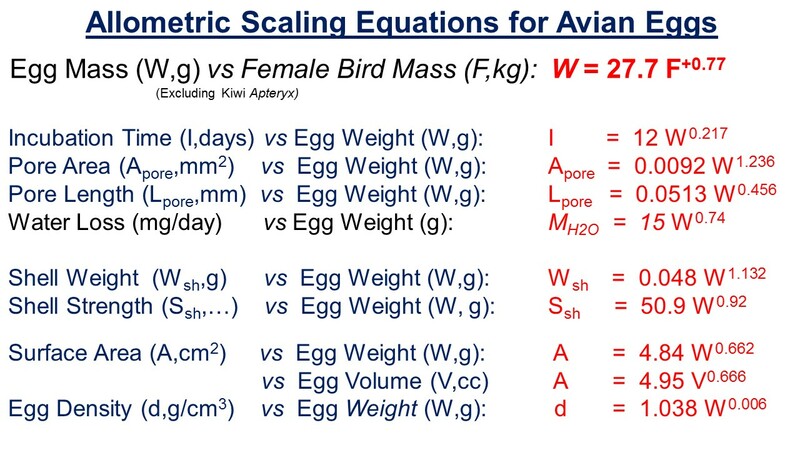 Final Word: It is interesting to note that many properties of avian eggs scale with egg size which itself scales with bird size in a systematic manner. In itself, the scaling is to be expected from simply increasing the bird weight - everything else remaining the same. However, environmental condition have required that avian eggs adapt to the external conditions and this is the case in many instances. A serious deviation from the scaling trend line may point to some peculiar circumstance and this can lead to some fundamental change in the way we interpret that piece of evidence. New Zealand kiwi is a good example of such a situation. It is my pleasure to thank Professor Dee Boersma for his help in giving me information about Magellanic penguins.